It is the summer of 1940. A woman rides her bike through the English countryside. Dawn has broken and the land begins to stir with the sound of birds and farm animals. But this summer the wind carries another sound as well - of warplanes. For this is the summer of the Battle of Britain and the inhabitants of this small island nation struggle for their very way of life against huge odds amassed along the coast of Europe. 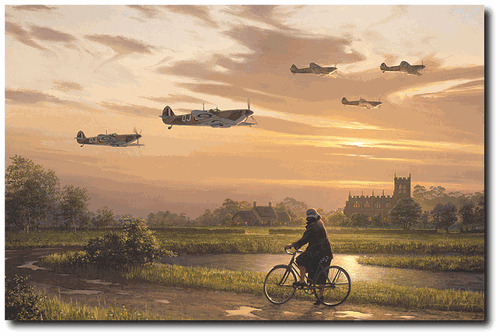 The woman stops, gazes upward and offers a silent prayer, as Spitfires from 92 Squadron roar skyward to search out and destroy the fighters and bombers of Hitler's Luftwaffe.